If you didn’t catch the Spring 2014 Newsletter on your door step, it is also available on our website here. You can view all the past issues here. 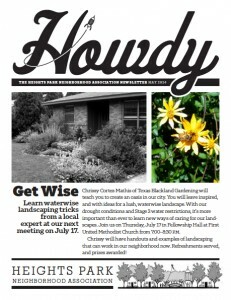 “Chrissy Cortez-Mathis of Texas Blackland Gardening will teach you to create an oasis in our city. You will leave inspired, and with ideas for a lush, waterwise landscape. With our drought conditions and Stage 3 water restrictions, it’s more important than ever to learn new ways of caring for our landscapes. Wednesday, May 14; 6:30 – 9:00 p.m. The Main Street/Central Expressway Corridor Study directly affects our Heights Park neighborhood! Attend this Workshop to continue the open dialog about zoning along this corridor. You may recall, in 2012 the City of Richardson and the Richardson community created a vision for redevelopment and revitalization of Main Street and the Central Expressway Corridor – Richardson’s original downtown and the major access route to the community, its business areas and neighborhoods. This vision was received by City Council in January 2013 and additional research has been underway since then. You are now being invited to participate in a rezoning initiative that will help carry out the community’s vision for this area. The City will host an initial Community Workshop on Wednesday, May 14, 2014 from 6:30 p.m. to 9:00 p.m., at the Richardson Civic Center/City Hall to begin the public discussion of rezoning the Corridor. Initial rezoning efforts will focus on four sub-districts within the larger Corridor area – Main Street, Central Place, Chinatown, and Interurban. The larger Corridor area is approximately 415 acres in size and extends generally from the southern city limit to Arapaho Road. The four sub-districts represent approximately 162 acres. So that there are enough seats and materials for everyone, please confirm your attendance at the Community Workshop by email at mainstreetcentral@cor.gov or by contacting Tina Firgens, Planning Projects Manager, City of Richardson, at 972-744-4248. Persons in need of translation assistance may request this service up to five days in advance of the Community Workshop by specifying the language for translation when confirming their attendance. Additional details on the Main Street/Central Expressway Corridor – Rezoning Initiative will be available on the City’s website at www.cor.net/mainstreetcentral. Thank you for your continued interest in the Main Street/Central Expressway Enhancement/ Redevelopment efforts. We look forward to having you join us as we work on the next phase of this project. May 2014 Yard of the Month! We are so excited to win Yard of the Month for May! I screamed when my husband walked in and read the letter to me. We’ve lived in our house for 7.5 years and every month I tell him I WANT that sign in my yard!! My whole life my mom and grandmother had a statue of St. Francis of Asisi in their yards. When we bought our house I just knew I needed one for our yard too and came across the perfect one at McKinney Trade Days. That statue is my contribution to the yard! My husband is a Landscape Architect so he likes to take control of the yard and plant things that are practical and will work for the space. Problem is, I always want to plant things that “won’t work” so he ends up sneaking to nursery by himself to pick everything out. This last round of planting was no different, except that our 4 year old daughter placed and planted everything instead of me. I think it’s a sign I need to take a back seat. When we moved into our house in 2006 the front flowerbed was nothing but Asian Jasmine. It was painstaking but we managed to rip it all out and as soon as we did all of the bushes that were being strangled by its roots began to flourish. Every Fall we plant pansies and coleus and every Spring we plant impatiens with a few miscellaneous items tossed about, sometimes caladiums, sometimes lantana, sometimes marigolds or gardenias. Last year our very loved Japanese Maple died on us and we were left with a patch in our flower bed that gets scalded by the sun. After trying a couple different things, we decided pintas were the way to go for that spot. We absolutely love our yard and everything about it! We can’t tell you how excited we are that we won this and thank you so much for the honor!